Yesterday in Paris, San Francisco Mayor Gavin Newsom announced that San Francisco will implement a pilot bike-sharing program this year through Clear Channel, the operator of SmartBikeDC. 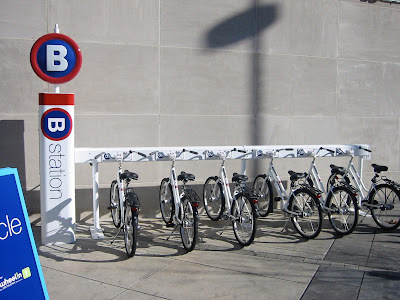 According to a press release from the Mayor's office, "The pilot program will include 50 bikes located at five stations on non-city property (as required by a Court injunction until environmental review of the City's Bicycle Plan is complete). 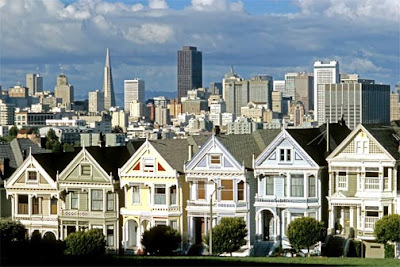 The stations will be in the Financial District, Mission Bay, the Presidio, Civic Center and the City College campus." The capital cost of the program is estimated to be between $400,000 - $500,000, while the annual operating costs will be around $450,000. 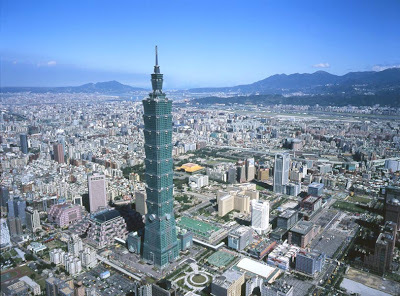 According to Central News Agency via Taiwan News, Giant Manufacturing Company will be launching a bike-sharing program in the business district around Taipei 101, the world's tallest occupied building. The Department of Transportation will allow Giant to set up 11 stations with 500 bikes for a planned launch in March. Taiwan News reports, "Customers will be required to use a credit card or the city's EasyCard to rent a bike. The first 30 minutes of rental will be free, and the rate for additional use will be set at NT$10 [Taiwan New Dollars (US$0.30)] for every 15 minutes. 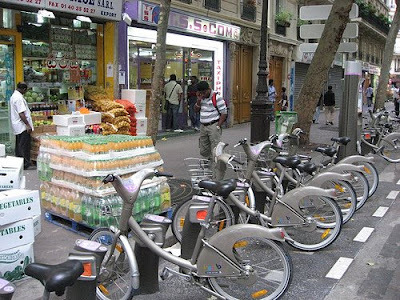 "The system will allow for bikes to be rented at one location and returned at a different point. If the bike is stolen, the renter will be required to pay NT$1,500 (US$45) in compensation, provided he or she could prove that the theft was reported to police within seven days. Otherwise, the compensation fee will be NT$3,000 [US$89]." A free program called Veloid provides many useful services to make bike-sharing even better. Veloid allows bike-sharers at any of 34 bike-sharing programs in Europe, North and South America, and New Zealand to find available bikes and slots, display maps of your favorite stations, show a timer with how much free time you have left for your rental period, and lots more. Veloid is available for the Android operating system on the T-Mobile G1 mobile phone. Veloid has English, French, and Spanish versions for download. A year and a half after its historic launch, the ubiquitous Vélib' are conquering Paris' suburbs with a grand expansion of its existing fleet. The expansion begins this week in the near suburb of Boulogne-Billancourt and is expected to be operational within four weeks. Then work begins next in Les Lilas, Gentilly, Issy-les-Moulineaux, Vincennes, Suresnes, Vanves, Saint-Ouen, and Pantin. When the expansion is complete there will an additional 300 new stations and 3,300 new bikes. 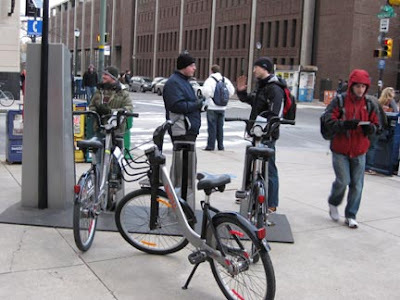 Hundreds of Philadelphians braved the extreme cold to experience 3rd generation bike sharing. Bike Share Philadelphia demonstrated Public Bike System's bike-sharing station to the public with bikes from both BIXI and NiceRide, Montreal's and Minneapolis' future bike-sharing programs. This is part of a two day celebration of the first anniversary of Bike Share Philadelphia’s quest for bike-sharing. The event also included the screening of videos about bike-sharing and livable streets from Streefilms.org. More information about today's events is at BikeSharePhilly. Today The Denver Post reports that Denver Mayor Hickenlooper announced the launch of the Denver B-Cycle bike-sharing program which will start off with 30 bikes for city employees and expand to the general public by this summer with 500 bikes and between 30 - 40 stations. The goal is 1,000 bikes and 70 stations by Summer 2010. This program is a direct result of the Humana and Bikes Belong’s Freewheel!n Presidential Conventions initiative from this summer. The initial group of 30 bikes and associated stations was donated by Humana and B-cycle. 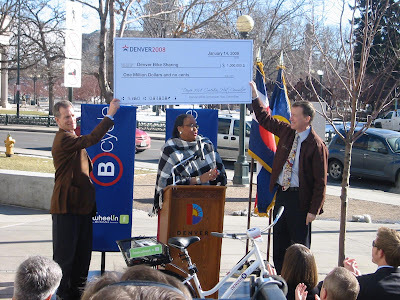 Top image caption: Former Denver City Councilwoman and Denver 2008 Convention Host Committee Chair Elbra Wedgeworth (center) presenting a check for $1 million to Denver Mayor John Hickenlooper (right) and Ken Gart (left), a local businessman and Chair of the non-profit organization that will administer the bike-sharing program. The money will be used to cover initial startup and maintenance costs for the Denver B-cycle bike sharing program. On the beaches Rio de Janiero, bike-sharing is called the Samba. Will bike-sharing on the beaches of Miami be the Conga? Miami Beach, Florida is expected to launch bike-sharing program using the B-cycle system with over 500 bikes in July 2009 according to Jeff Hicks, CEO of Crispin Porter + Bogusky, a partner in the B-cycle company, from an interview in Adweek.com. Theo Carrasco, procurement coordinator for Miami Beach, said the evaluation committee recommended B-cycle on December 23, 2008 for the a final decision on January 29, 2008. 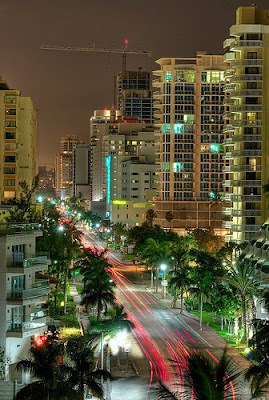 The program starting in South Beach is to expand to North Beach to include all of Miami Beach. Users of the system will be able to track their personal usage online. We expect the user interface of the system to be more advanced than what is currently available in the United States. The question now is, what will be the next U.S. city to join the Conga line? featuring Streetfilms' Bike Share Videos at the Academy of Natural Sciences on Logan Square 19th and Race Streets Philadelphia. No charge. The creators of Streetfilms, where you'll find an eclectic array of 'livable streets' films from all over the world made to inspire change on the streets of your neighborhood, will show all its bike-share videos and a great selection of 'livable streets' films on the "Big Screen" in support of Bike Share Philadelphia as one of the Academy of Natural Sciences Town Square Series. Streetfilms and Streetsblog are the political mobilizer for the Livable Streets movement. They are part of a growing coalition of individuals and organizations in cities around the world working to transform our cities by reducing dependence on private automobiles and improving conditions for cyclists, pedestrians and transit riders. They have picked the anniversary of Philadelphia's Bike Share movement to showcase their videos on bike-sharing and livable streets.